This is the book that will teach programmers to write faster, more efficient code for parallel processors. The reader is introduced to a vast array of procedures and paradigms on which actual coding may be based. Examples and real-life simulations using these devices are presented in C and FORTRAN. Background: Parallel Paradigms. The Hardware and Operating System Environment. Pre-Power Language Parallel Programming. Application of Parallel Primitives to Real Problems. IRIS Power-Language Prelude: Data Dependence. Parallelization of Loops. The IRIS Power Languages: Power Fortran Essentials. Power Fortran Toolbox. Performance Issues. Managing Fortran Data Dependence. Advanced Features of Power Fortran. IRIS Power C Performance Issue. Power Language Analyzers: Power Fortran Accelerator Essentials. Power Fortran Accelerator Toolbox. PFA Advanced Features and Optimizations. PCA Basics. PCA Toolbox. PCA Advanced Features and Optimizations. 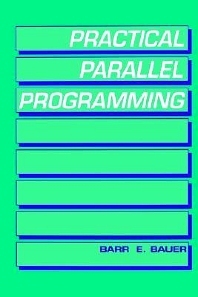 Parallel Program Development. Problems in Practical Parallelization Strategies. Chapter References. Index.